Liverpool drew for the fourth time in six league games in a painfully frustrating afternoon at Goodison Park, suffering a significant blow in the title race. Mohamed Salah failed to convert excellent chances in both halves, while the second-half performance was ragged as Liverpool constantly misplaced simple passes in the final third. Poor decision-making and a lack of composure proved costly again, similar to last weekend’s goalless draw at Old Trafford. Everton put in a determined display and could have snatched the victory as the players fed off the hostile atmosphere. Here’s how Liverpool fans reacted to the performance. Poor initial touch from Salah narrowed the angle for himself. Really should’ve done better and made use of the fact Pickford stayed on his line for so long. What a chance. In such a high stakes game and during a high-flying season, Mohamed Salah has absolutely got to score that chance. We can't afford to miss such clear-cut opportunities. – Gift Moyo on Facebook. Could really do without Salah’s touch being appalling. A horrific performance from Salah this. Simply not good enough in a game where you need the main men to stand up. – JMac8 on the forums. Salah absolutely wretched too. Again. Lallana on for Mane when chasing a goal. Really, Jurgen? – Crickey Green on Facebook. Absolutely abysmal use of the bench. Explanations must be demanded. Jurgen Klopp has had another mare. Such bad management. Bad selections & bad subs are losing us this league. Van Dijk is the only player that can walk away from that game with his head held high, outstanding performance as usual from him. We are nothing without Van Dijk. He might as well manage us. 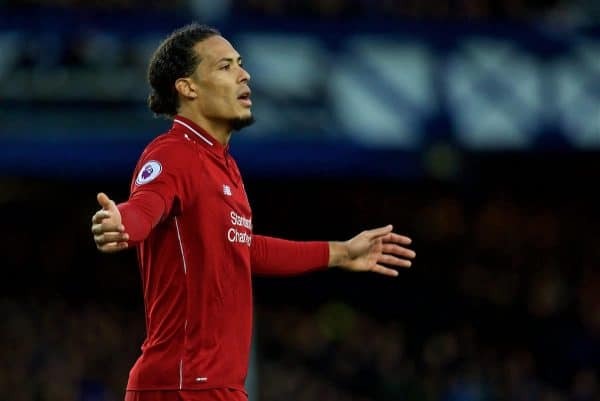 Van Dijk plays football like an older brother taking the piss against his little brother's mates. Effortless in everything he does. – SirBillShankly on the forums. also, we watched this exact game last weekend. sucked then, sucked now. – Rolf Harris on Facebook. Now we can only hope that other teams put in as much effort against City as Everton did (unlikely though that is). – Daniel Evans on Facebook. If you want to keep up with this brilliant City side, you can’t miss the chances we did today. – IndianScouser on the forums. Well, all those fans who obsess over City’s results now have genuine reason to continue doing so. Lead given away. Was it hard? Yes. But was it possible? Without doubt. Now? Well, now you have to hope for favours. Two months frittering away a seven point lead while City rediscover their form so that we can head into the final stretch in second. Having gone through them, I was never convinced 09 or 14 were us throwing it away. Right now, this does feel like us throwing it away. 4 draws in last 6 league games, simply not good enough when City are going at the rate they're going at. Awful 2nd half performance in particular, woeful number of misplaced passes, and really bizarre subs made it worse, if anything. Really uphill battle now.